This Homemade Mixed Berry Pie gives me all the feels! It is without a doubt my most favorite dessert and just reminds me of my childhood and the family that ate it together. My family owned and operated a country store in upstate New York for 30 years. Growing up – this was my home. We made all our own baked goods, including pies, cookies, cupcakes, muffins, and mini breads, and had a full-service deli. We sold groceries, gas and gifts and had a small wine & liquor store as well. You name it, we had it! My mother would make pies, 60 at a time and put them in the freezer to be baked on demand. She would make them during the week to be baked on the weekends, which was our busiest time of the week. Just to do some math – 60 pies means she had to roll out 120 crusts, and make ALL the dough (by hand) to be rolled in ONE day. We had peach, apple, blackberry, raspberry, blueberry, cherry, strawberry-rhubarb, and my favorite, homemade mixed berry pie. It’s a combination of blueberries, raspberries, blackberries and strawberries and it is SO GOOD. Making pie dough by hand is actually a simple process, with simple ingredients, but it can make all the difference in your pies. This dough only has three ingredients, but it is so flaky and flavorful. Go ahead and give it a try. Combine the Crisco and the flour in a mixing bowl using a dough hook until crumbly. Gradually add in the cool water until a ball forms. Do not overmix. Remove the ball from the bowl and store in refrigerator, covered in a wet paper towel. In a medium sized bowl, combine the berries, cornstarch, flour and sugar until the berries are coated with the white mixture. Grab a chunk of dough about the size of a tennis ball and roll it out on a floured surface using a rolling pin. Note: The size of the dough ball for each crust will depend on the size of your pie plate. A larger pie plate will need a larger ball of dough. Line your pie dish with the first crust. Roll out the second crust and place on top of the berries. Crimp the sides. You can use a fork to pinch the top and bottom together, or gently fold the top crust under the bottom crust and pinch it with your fingers. Free free to get as decorative as you like. 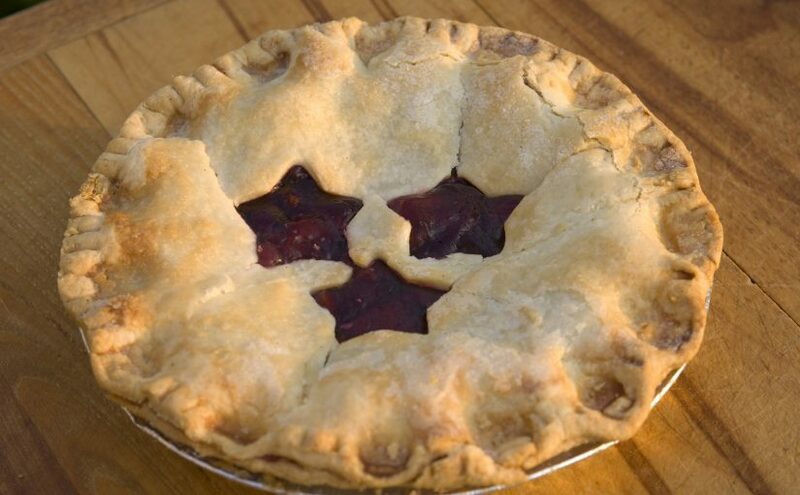 Use a fork to prick the top of the pie to allow air to escape while the pie is baking. OPTIONAL: While the top crust is being rolled, cut a few shaped (like stars) into the middle of the crust for a decorative look. Use leftover pie dough to make hand pies, or twist it into strips, roll in cinnamon sugar and bake along with the pie for mini “churros”.